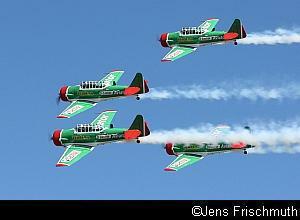 The 2009 Rand Airshow took place on the 17th May 2009 under clear blue skies. The good weather attracted a huge crowd, estimated to be in the region of 22 000 spectators. The good attendance and impressive flying displays made the day a huge success. Proceedings started with one of the day's highlights, a Mass Radial Display. The sight of 11 Harvards, a Douglas DC-3 Dakota and the South African Airways Museum's Junkers Ju52/3m starting up, taxying past the spectators and taking off rapidly one behind the other created a buzz around the airfield. 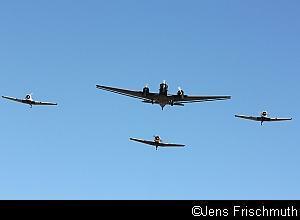 The formation fly-past of the Harvards followed by the DC-3 and the Ju52 was truly impressive. The fly-past was followed by a short solo display of the DC-3. Thereafter, the Ju52 flew a few circuits on her own. Seeing this grand old lady back in the skies after being grounded for a few years was a real privilege. After the DC-3 and Ju52 displays, the 11 Harvards approached the airfield again in formation and broke off the formation two by two in front of the crowd. After landing, all the Harvards lined up in front of the crowd and performed a mass shutdown. Next, the SA Police Air Wing staged a simulated hijack and rescue exercise with no less than five different types of helicopters currently in service with them. 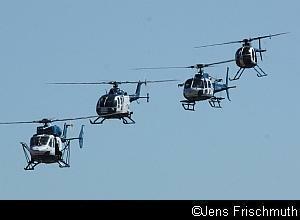 The helicopters used to drop police reaction units at the "scene" consisted of an AS350 Squirrel, a MD500E, a BK-117 and a BO-105. One of the newly acquired Robinson R44s with special surveillance equipment flew overhead and directed proceedings. Various other helicopters flew during the day. A formation display of a Bell UH-1B Huey and a Bell 230 was followed by individual displays of both helicopters. 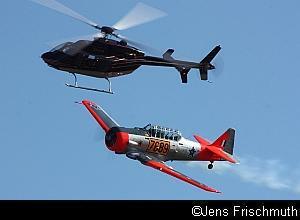 Other solo displays were flown by a Robinson R22 and a Hughes MD 500D. A rather unique display consisted of a formation display of a Bell 407 helicopter and a North American Harvard. The flight envelopes of the two machines are similar enough to allow for an interesting display. The formation aerobatic teams were out in full force. The Chipmunk Formation Team of Jason Beamish, Brian Gruar and Elton Bondi were the first ones to display their flying skills and they were followed by the North West Eagles. Yet again Nigel Hopkins and Larry Beamish, two veterans of the air show circuit, demonstrated their exceptional plane control with some impressive maneuvers. After participating in the mass radial display with five of their planes, the Flying Lions flew their impressive four-ship routine in the always popular Harvards. The Gabriel Wings Team has added a fourth Pitts Special to their team for this year and Sally Bates joins her father Scully Levin and brother Ellis Levin and Arnie Meneghelli in the formation. Interestingly, the new plane is painted in black and red colours as opposed to the predominantly white of the other three. This contrast creates some interesting photo opportunities. 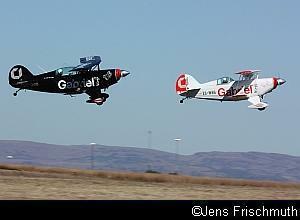 The Wesbank/ Goodyear Eagles flew another polished display which included cross-overs and head-on passes. The Albatross Formation Team of Ralf Dominick, Brian Gruar and Pieter van der Westhuizen put their large and noisy ex-SAAF Piaggio Albatrosses through their paces. The final aerobatic team display consisted of two Yak 52s. Individual aerobatic displays were flown by a Slick 360, a Yak 55, Warren Haslam's Zlin Z-50LS, the Cessna T-41 "Bush Air 1" of CC Pocock and Elton Bondi's Extra 200. CC also used his plane for a parachute drop. 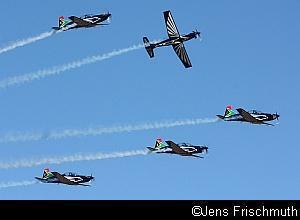 South African Air Force participation was limited to a display by the Silver Falcons. The team, consisting of team leader Major Scott Ternent, Capt. Roy Sproul, Capt. Buti Tsebe, Capt. Gerard Lourens and Major Nico Frylinck had a busy weekend. Besides flying their display at the Rand Airshow on the Sunday, they flew a display at the SAAF Museum's Flying Day at Air Force Base Swartkop on the Saturday and flew a display at the Air Force Memorial in Valhalla on the Sunday. On both occasions, they returned to Rand Airport in echelon formation and performed a formation break over the airport before landing. A welcome return to the air show scene was the Aerovodochody L-29 Delfin jet flown by Ralf Dominick. Ralf, call-sign "Ice", showed us that he has lost none of his touch by flying an impressive solo display in the jet in which he lead the Sasol Tigers Formation Team for many years. Another highlight was the SAA Cargo Boeing 737-200 display flown by Pierre Gouws. The display included an impressive touch-an-go. 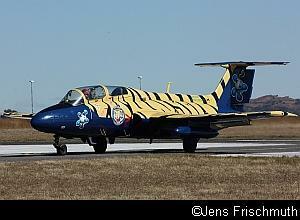 Pierre Gouws also flew the last display of the day, a solo display in the ever popular L-39 jet ZU-TEE. After the displays finished at around four o'clock, many participating aircraft departed for their home bases. After taking off, the Junkers Ju52/3m flew overhead the airfield in formation with the two SAA Museum Harvards and a Harvard owned by the Harvard Club, a great ending to a highly successful air show. Our praise goes to Anton Kruger and his team for staging a terrific event.